Day 19: Day Off! Taking Stock and Relaxing; Zen with no Art of Motorcycle Maintenance. My first complete day off in over 4700 miles. I needed it. Big Red, the Harley, needed it. I’ve spent most of it walking around the little town, drinking cups of coffee, sitting on seaside benches and sleeping. In other words, getting ready for retirement someday. Jokes aside, my friends who are retired don’t seem to have much down time. Back in Rome, Georgia my friend Karl, who just turned 80 is busier than I am, what with all his swimming, the many organizations he belongs to and his volunteer work in various civic programs. Still trying to make the world a better place and doing it a bit at a time. Or Robert, who I believe is 93, writer, artist, designer, philosopher, former military, former dance instructor who still plays bridge once a week, attends our Saturday pipe smoking group and, when leaving, gives us an example of his dancing skills. That reminds me, Karl, among other things, is our Imperial Turtle, the local head of our International Association of Turtles. He inspires respect, friendship and loyalty and gives them freely. In fact, Karl told me to take a day off. So I did. His influence extends even as far as Seaside, Oregon. I feel better, but I am worried about Big Red. For the last few days she’s been making sounds that are very unfamiliar to me. She still rides fairly smoothly, doesn’t cut off on me, and I can’t tell if it’s engine or exhaust related or what. I can’t find any leaks, she has plenty of oil and nothing seems to be loose. That’s about the extent of my motorcycle repair knowledge. 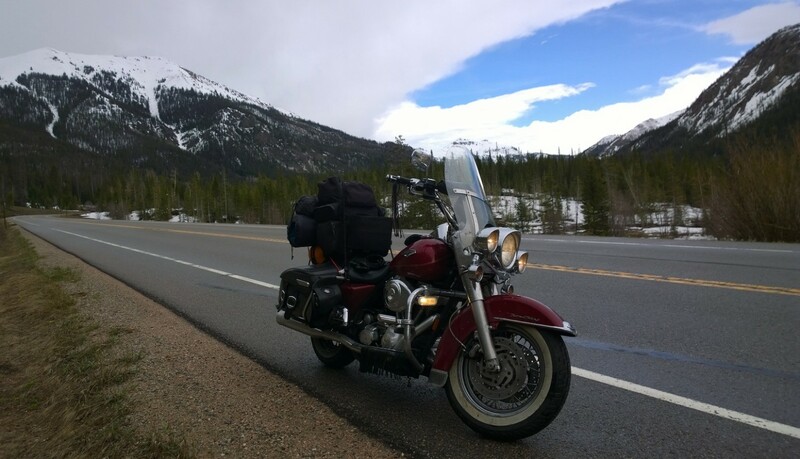 This blog is Zen without any aptitude or art of motorcycle maintenance. We have about 1000 miles to go to Los Angeles and Big Red intimates that she can make it. I’m just worried. But we’ll cross that bridge when we come to it. But bridges have a way of showing up anywhere, unexpected. In fact, sometimes I think God, or the Universe just throws a damn bridge in your way when you least expect it and says: there now; make a decision. See, this is what happens when I take a day off from riding. I start getting philosophical. But it’s going to take more than a little philosophical WD-40 to get us to LA. Still, we’ll cross that bridge when we come to it. ← Day 18 Continued; Seaside, Oregon; Zen Rediscovered (It was here all the time! ); I Discovered the Pacific Ocean!!! I hope you and Big Red are OK. As I’ve aged, I find I’ve been making sounds that are unfamiliar to me. You may need more than WD 40. I rust you have some duct tape with you, too – you may need it! Or Big Red may need it. Glad to see you’re making the journey safely. Good idea to take a day off. Maybe one or two days off will give you and Big Red a boost as you head down the coast.